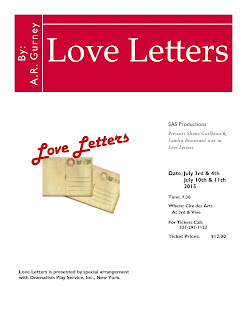 Love Letters by A. R. Gurney will run at Cite des Arts July 3rd & 4th and 10th & 11th at 7:30pm. Shane Guilbeau and Sandra Broussard will star in this touching story. This play is an exchange of two people who grew up together and share their lives through letters. You are sure to laugh and cry and be touched by these characters. Andrew Makepeace Ladd II and Melissa Gardner, the characters in this story, are both born to wealth and position. Through the letters exchanged, you will be given a glimpse of their lives through the years. For anyone who has had a lifelong friend, you are sure to enjoy this story. Make sure you mark your calendars for the first two weekends in July. As many of you know, Shane Guilbeau and Sandra Broussard always have a wonderful chemistry together on stage. Both Shane and Sandra are Speech/Drama teachers in Lafayette parish. They have both done work on the stage and screen in a variety of commercials. Catch these rising stars at Cite des Arts while you can. Advance tickets can be purchased at www.citedesarts.org, or by calling Cite des Arts at 337-291-1122.